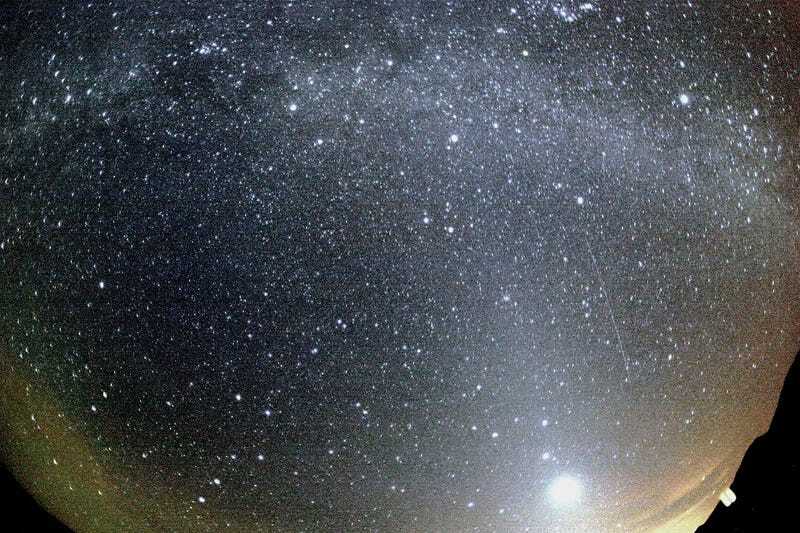 The Orionids come but one night a year—and that night is tonight. Here’s how, when, and why to watch the meteor shower tonight, along with one other strange phenomenon that you may be able to catch alongside it. 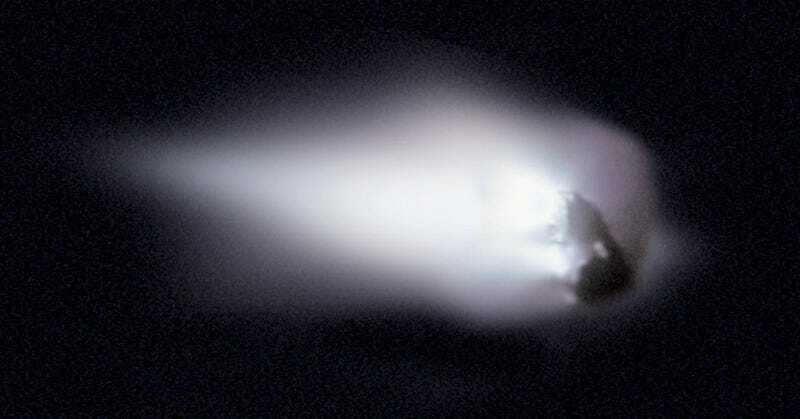 The Orionids are made up from debris burning up in the atmosphere from Halley’s Comet. The number of meteors you’ll see during this shower varies quite a bit from year-to-year—and this year, quite frankly, may be a slightly thin shower. 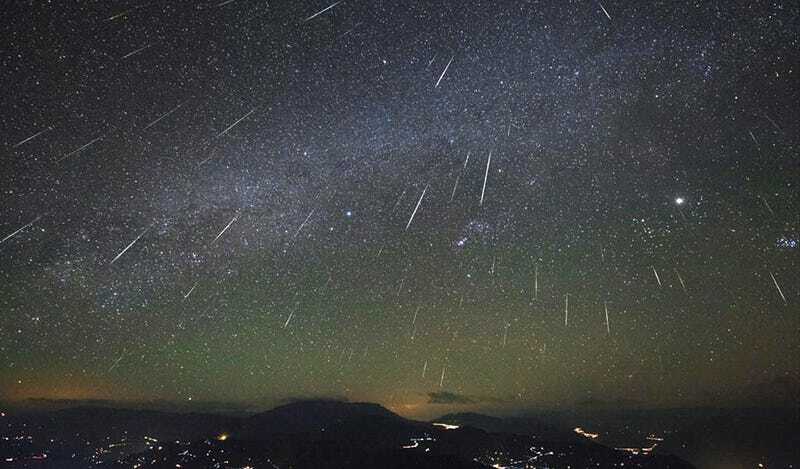 Slooh Observatory is predicting a peak of 30 meteors an hour (a respectable showing), while NASA estimates that we’re going to peak at just a dozen meteors per hour this year. Compare that to the average of one hundred meteors per hour we glimpsed this past summer during the fast-falling Perseids. Still, even if the number of meteors isn’t much to get jazzed about, what this year’s Orionids lack in number, they make up for in a few other ways. Part of what makes this shower so enjoyable is the sky around it—with a radiant (the point where the shower appears to originate from our vantage point here on Earth) nestled in between two of the most easily recognizable constellations, Orion and Gemini. But even more stunning is its speed. Orionid meteors are unusually quick, streaking across the sky at almost 150,000 mph, making them the second fastest meteor shower of the year (edged out just narrowly by the Leonids). Those short, quick trails of light are in themselves pretty cool, but they also mean that conditions are unusually good for catching an odd phenomenon: meteor smoke. Sometimes, as it streaks across the sky, a meteor or fireball will actually explode. Sounds pretty dramatic—and it is, not because you can see the explosion though, but because it leaves behind a thick trail of ionized air in its wake that you can see as light (not actually smoke). This trail lingers in the air, actually being shifted around by atmospheric wind into wavy shapes that can last much longer than the original streak of the meteor, sometimes even minutes. So, How do I watch? So how can you catch the Orionids, and all those spooky meteor smoke trails they may leave in their wake? It’s pretty easy. There’s just a couple things to keep in mind. What time is the shower? You can catch the Orionids starting late Wednesday night and into the very early morning hours of Thursday morning. This is a somewhat unusual shower in that the best time to catch it will actually be in the pre-sunrise hours after the moon has set at around 2 a.m. Not only will this keep the moon out of your way, it’s also when NASA is predicting the heaviest fall. If a 3 a.m. wakeup call isn’t in the cards for you, that’s fine. You should be able to see some meteors earlier in the night, too. What else do I need to watch it? Darkness is always, always the number one rule for good meteor shower visibility—but, because of the sparseness of the meteors in this particular shower it’s especially paramount for this one. So, if you’re usually a backyard astronomer, this may be a good time to try to head a little outwards into your surrounding country. It’s probably going to be frosty enough that you’ll want to make sure to bring blankets, jackets, hats and the whole cold weather works, plus a thermos of coffee (for both the earliness of the hour and the warmth). 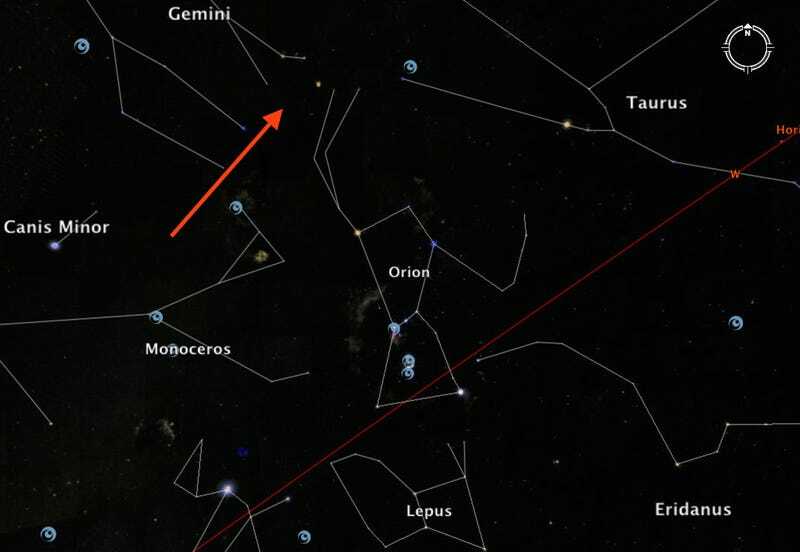 A starwheel or sky mapping app is never a bad idea, although for this meteor shower finding the radiant is less complicated than usual: Just locate Orion, and then look a little bit upwards. While the radiant is going to be a good starting point, though, you’re going to want to make sure you’re someplace where you can easily lay out, on either blanket or a lawnchair, and see the whole sky. That’s partly because these meteors move so quickly, but also, you want to be in a good position to catch any meteor smoke trails that may appear. Of course, if you can’t manage to catch it outdoors, you can always watch the Slooh observatory livefeed right here or the NASA one right here.